We are a Meals on Wheels for Animals. Many people find themselves in a financial hardship situation and have pets, some must make the difficult choice to surrender/give-away their pet(s) to a traditional rescue/shelter where their days are usually limited. We step in to help so a pet parent does not need to make that difficult choice. We have changed the way "Rescue" is usually done - we go directly to the home, to keep animals where they belong. 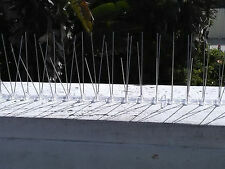 BirdBusters Stainless Steel Bird Spikes covers 60'- pigeon control wide ledges! Rotating Attack Eagle Decoy Scares Birds - Wind Driven Works better then Owls! Attack Eagle Bird Deterrent Decoy with Wings Spread Scare Away Pest Birds!